Mothers birthstone rings in sterling silver and gold. Beautiful family jewelry. 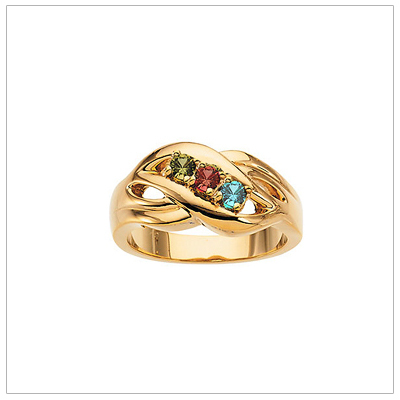 Crossover family birthstone mothers rings in 10kt yellow gold. Available with 1 - 5 birthstones. 10kt gold mothers rings with wide scroll patterned band. Genuine birthstones on the mothers rings. 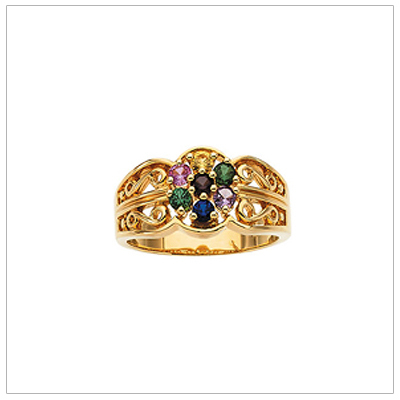 Our traditional mothers rings in 10kt yellow gold and genuine birthstones. 1 - 5 birthstones. Mothers rings in sterling with beautiful scroll patterned band. Custom sizes available. 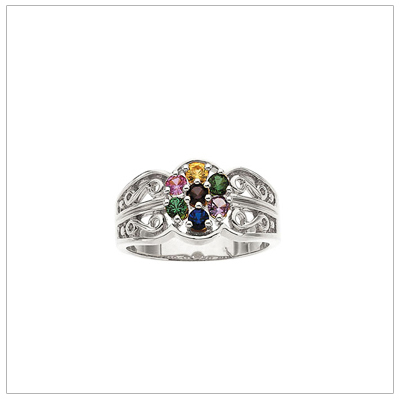 Sterling family birthstone mothers rings with a crossover band. Available with 1 - 5 birthstones. 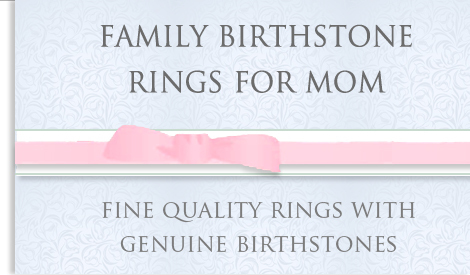 Traditional style mothers rings with genuine birthstones. Customize with 1 to 5 birthstones. Crossover style family birthstone mothers rings in 10kt white gold. Available with 1 -5 birthstones. 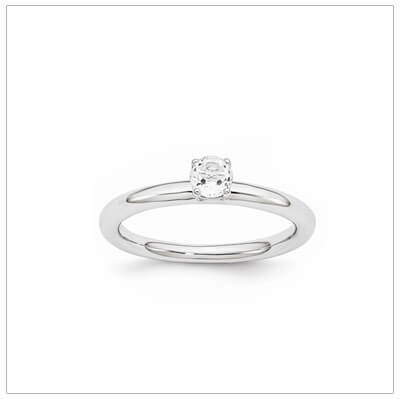 Mothers rings in beautiful 10kt white gold. 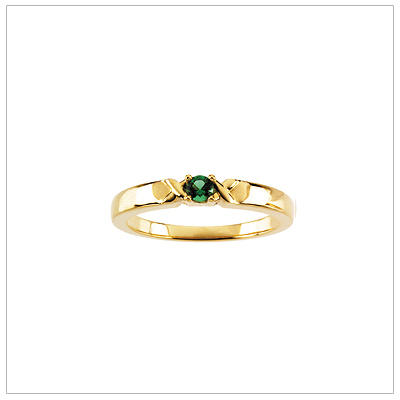 The ring has a lovely scrolled band and genuine birthstones. Classic mothers rings with genuine birthstones in 10kt white gold. Customize with 1 to 5 stones. 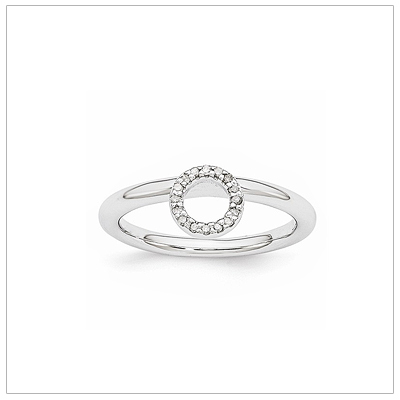 Stackable diamond halo rings in sterling silver with genuine diamonds. Sizes 5, 6, 7, 8. 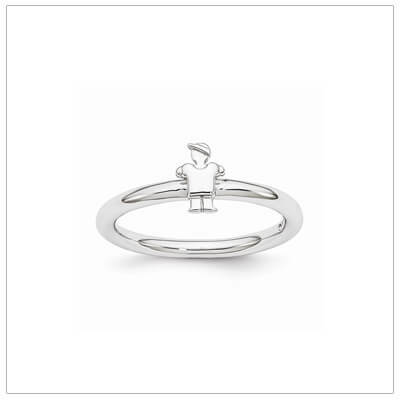 Stackable mother rings with tiny boys wearing a ball cap. Sterling silver. 3 sizes available. 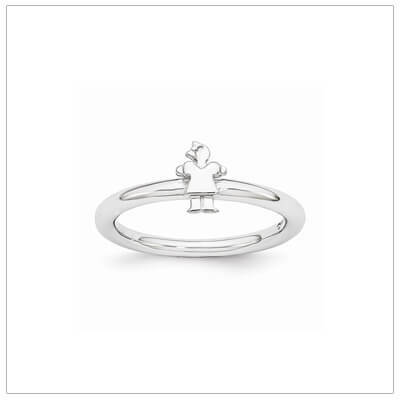 Adorable mother rings with tiny girls wearing a bow. Sterling silver. 3 sizes available. 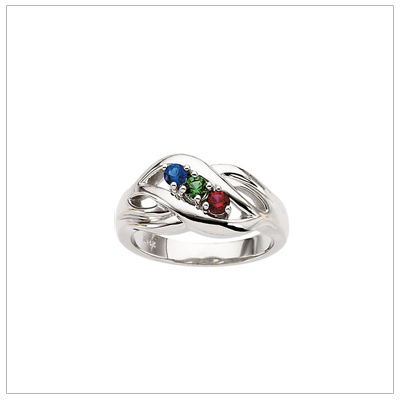 Stackable birthstone rings in sterling silver. Quality rings with a garnet birthstone. Sizes 5, 6, 7, 8. 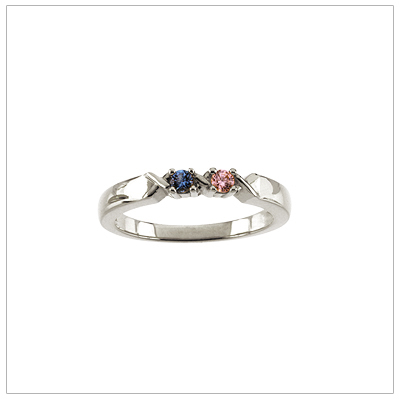 Stackable birthstone rings in sterling silver. Quality rings with amethyst birthstone. Sizes 5, 6, 7, 8. 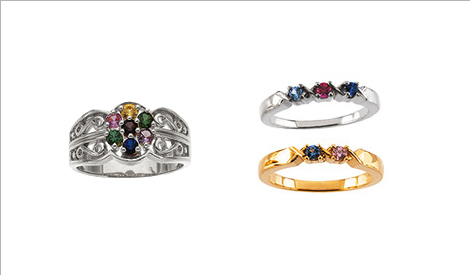 Stackable birthstone rings in sterling silver. 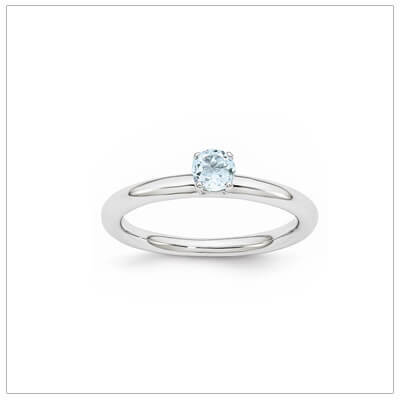 Quality rings with aquamarine birthstone. Sizes 5, 6, 7, 8. 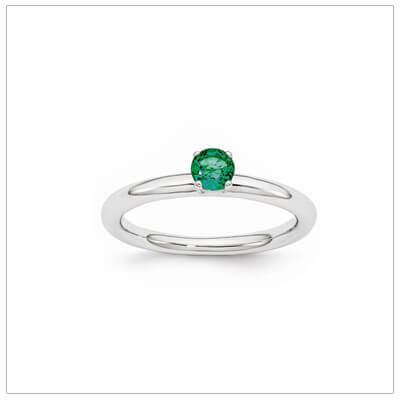 Stackable birthstone rings in sterling silver. Quality rings with white topaz birthstone. Sizes 5, 6, 7, 8. 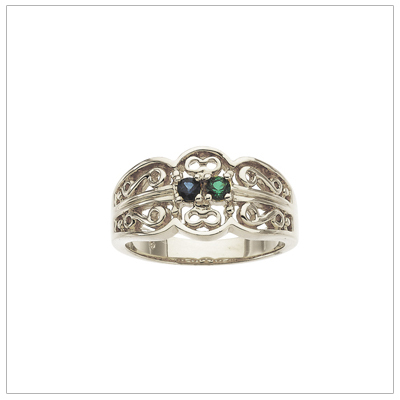 Stackable birthstone rings in sterling silver. Rings have created emerald birthstone. Sizes 5, 6, 7, 8. 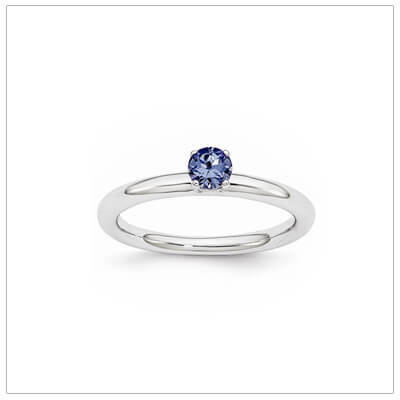 Stackable birthstone rings in sterling silver. Rings have rhodolite garnet birthstone. Sizes 5, 6, 7, 8. Stackable birthstone rings in sterling silver. Rings have created ruby birthstone. Sizes 5, 6, 7, 8. Stackable birthstone rings in sterling silver. Rings have peridot birthstone. Sizes 5, 6, 7, 8. Stackable birthstone rings in sterling silver. Rings have created sapphire birthstone. Sizes 5, 6, 7, 8. Stackable birthstone rings in sterling silver. Rings have pink tourmaline birthstone. Sizes 5, 6, 7, 8. 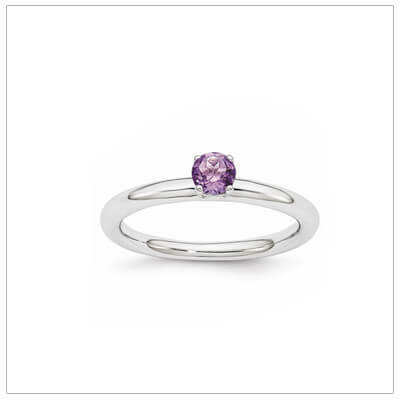 Stackable birthstone rings in sterling silver. 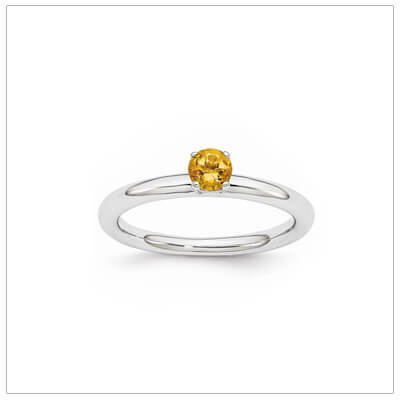 Rings have citrine birthstone. Sizes 5, 6, 7, 8. Stackable birthstone rings in sterling silver. 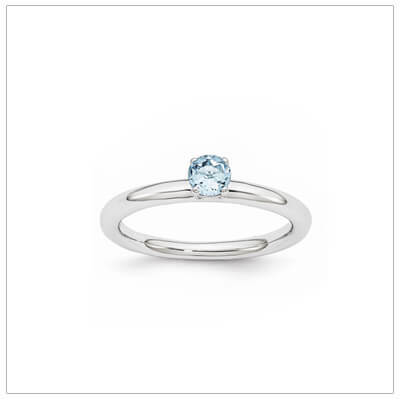 Rings have blue topaz birthstone. Sizes 5, 6, 7, 8. Stackable mothers rings with a tiny boy and genuine garnet birthstone. Sterling silver. 3 sizes. Stackable mothers rings with a tiny girl and a genuine garnet birthstone. Sterling silver. 3 sizes. 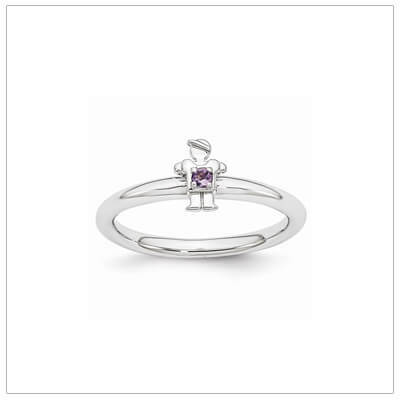 Stackable mothers rings with a tiny boy and genuine amethyst birthstone. Sterling silver. 3 sizes. Stackable mothers rings with a tiny girl and a genuine amethyst birthstone. Sterling silver. 3 sizes. 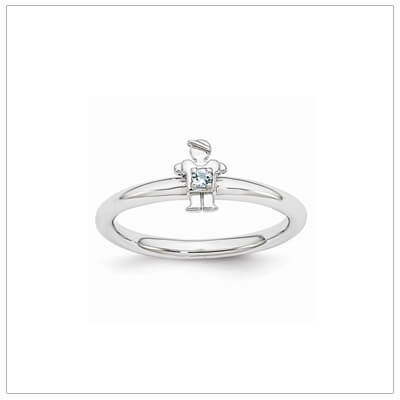 Stackable mothers rings with a tiny boy and genuine aquamarine birthstone. Sterling silver. 3 sizes. Stackable mothers rings with a tiny girl and a genuine aquamarine birthstone. Sterling silver. 3 sizes.